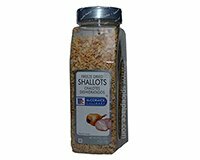 For dishes high in liquid, such as soups, stews, gravies, sauces, vegetables, and salad dressings, add freeze dried shallots directly to food and allow to cook or stand for 3 minutes to allow shallots to reconstitute. For dishes with little or no moisture, cover McCormick Freeze-Dried Shallots with cold water and allow to stand for 3 minutes. Then drain off any excess water. Shallots are ready to use.